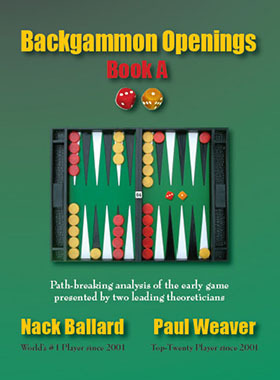 Backgammon Openings by Nack Ballard and Paul Weaver. Finally, the first book in the long-awaited Backgammon Openings series is available. Many players helped with the millions of rollouts needed for this project. Book A is concerned with playing 3-1 on the first three rolls of the game. Of course, it is hugely correct to make the 5-point with an opening 3-1 and usually, but not always, correct to make it in response to some opening rolls. The chapter about 2nd roll positions shows and discusses some of those examples. The majority of the book’s backgammon content discusses 3rd roll plays of 3-1, and these can be very interesting and instructive. The 3rd roll of the game is the second turn of the player who won the opening roll. 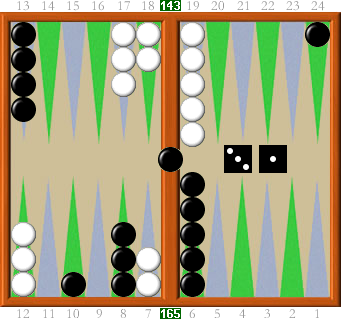 Why study the openings in backgammon? Many players think that the opening plays and responses are simply a matter of style, but rollouts by bots that play as well as any human have shown that even world-class players used to make and still make some significant errors. It is also very important to study 3rd roll plays since the game is starting to develop, and the same principles may apply on subsequent moves as the opening stage of the game progresses. Sometimes there’s significant hitting and running in the beginning of a game, and positions where each side has made a few rolls can be quite similar to those after three rolls. 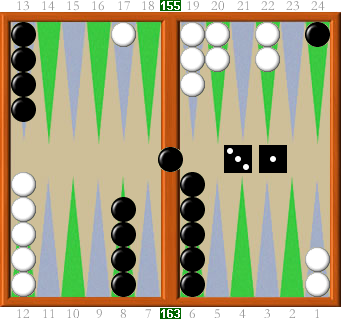 To answer my question, it is very important to study the opening phase of backgammon since it occurs in every game. Players who minimize the amount of times that they give up .04 or .05 equity in the early game are more likely to reach nicely playable positions and less likely to drift into positions where they need to roll a joker to avoid the cube. It is worth noting that there are a couple sites online that list extensive rollouts of the opening and 2nd roll replies, and one site is listing rollouts of 3rd roll plays. With that in mind, and considering that one can perform his own rollouts, why buy this book when you can get much of the same information online for free? With this very well-written book, you get the comments and reasoning from two of the world’s best players, Nack Ballard of California and Paul Weaver of Alabama. The authors have obviously spent much time writing and going over everything again and again to insure that it is directly to the point. I’ll give an example of a 2nd roll play from the book and quote from what the authors say on that page to show you how well-done this book is. On page 12, the position concerns playing a 3-1 in response to an opening 6-4 split (24/18, 13/9), and I trust my readers can follow this without a diagram. The page has four diagrams, with the first one showing the split opening 6-4 play with the dice roll to play being 3-1. Then the authors state, “Making the 5-point [upper right diagram] is tied. If White fails to anchor, Black’s 5-point improves his chance of priming or attacking White’s back checkers. • It retards White’s offensive development. • It keeps her from anchoring on Black’s 7-point. • It threatens White’s outfield blot. • It blows an opportunity to make the 5-point. • It gives White 15 shots at the 7-point blot. The authors go on to say that some experts may prefer the complications arising from hitting and splitting, and that hit and split is best at DMP and Gammon Go, while the 5-point is best at Gammon Save. The page concludes by referring one to the last diagram which says that hit and down (8/7*, 13/10) is a blunder (wrong by .06 to .10). The diagrams on the page show each of the three possible plays, and the top two are captioned “best” (tied). Page 13 follows and is concerned with the play of a 3-1 after a 6-3 split, and making the 5-point there is better than hitting and splitting! Those desiring the reasons why should buy this extremely well-written book. The backgammon content in the entire book is analyzed just as well as the example given above. Many times a close play is followed by a slightly different opening position where just having one checker in a different spot means that another play is correct. Here are a few examples from the book that may surprise some players. This first one is not about a 3-1 play but is simply shown to illustrate the importance of the 5-point. This position occurs after Black’s opening 6-1 followed by White’s 3-2 minor split (24/22, 13/10). Black faces a 2-1 roll. The authors state, and this was quite a shock to me, that making the 5-point is best!! It is common expert practice to break the barpoint with a follow-up 2-1 to make the 5-point, but not when it leaves a double shot. However, as the authors point out, many of the hitting numbers are duplicated and the 5-point is so very important. This position arises after you split a 5-4 opening roll and get drilled by 3-3 making two inside points. Already in trouble, you have a 3-1 to play. Most players are afraid to make what is given as the marginally correct play here, which is to enter and split to the 21-point to try to counter White’s priming advantage, since he only has 8 checkers in the attacking zone. By marginally correct, the authors mean correct by .02 to .03. The page concludes by stating that building 13/10 is best at Gammon Go. This position occurs after an opening 6-3 split is hammered by 6-6, making both barpoints. In this unhappy position, Black must play a 3-1 from the bar. Prior to seeing this in the book and knowing how thoroughly everything was rolled out, I have to say that there was no force on earth strong enough to cause me not to enter on the acepoint and cover my 10-point! However, that passive play is marginally wrong! The play that best meets the long-term goals of the position is bar/22, 6/5, since it is often necessary to hit a shot at some point to win this game, and long-term prospects aren’t so good stuck back on the acepoint. At Gammon Save, however, simply cover the 10-point. In summary, the content in this superb book is some of the best writing I’ve ever seen in a backgammon book. It is lucid and to the point without being overly verbose. The book has a hard cover with an interesting 3rd roll 3-1 to play shown on the jacket. Thick 8.5″ x 11″ pages are found inside the book, and I’m certain this book will last a long time, surviving many readings and my frequent trips to the index of 3rd roll positions. All the information needed to understand this book is meticulously given, and there’s a nice introduction as well as appendixes. The authors don’t state that a play rolled out is correct by .034, but they prefer to state that it is correct, and they give a detailed table with terms such as “barely correct” and “blowout” and “whopper,” etc. Nactation is introduced, which is Nack’s shorthand system for describing the various types of checker movements. My grade for this very well-written and produced book is an A-minus. Like some of my prep school teachers, I rarely give out any grades this good, but this book, once again, contains some of the best writing I’ve ever seen about backgammon. 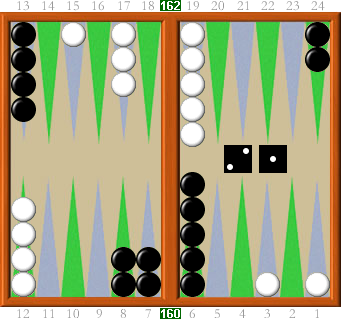 For me, the opening phase of backgammon is important, and there’s major value in the 3rd roll plays. Considering that I like this book so much, one may wonder why I didn’t give it an A or A+. While the content in this book is superb, I’d like to have seen a bit more. Outside of the core 64 pages, there are quite a few examples and comparison positions and a bit of match play discussion. The comparisons discuss many important and relevant factors. The book is 126 pages, which includes 19 pages of introduction. However, there are a few too many blank pages for my taste. A glaring omission, in my humble opinion, is the lack of a table of 2nd roll responses to an opening 3-1 and most preferably at all the important match scores such as DMP, GG, and GS. When one considers how many opening rolls there are, and even noting that it may be possible to combine two of them into a single book, this entire series may be rather costly for some players’ budgets. If Book B is as marvelously written as Book A and has a table of responses to the opening rolls it covers, along with a bit more content (perhaps including more 3rd roll positions if possible), I’d expect to grade it an A+. A great way to add some content to the next book would be to discuss the interesting replies to the opening roll under consideration and how the various match scores affect them. Hats off to Paul and Nack for a superb contribution to backgammon that belongs on every player’s bookshelf. Neil Kazaross of Chicago is the all-time leader of the ABT and is currently Backgammon Giant #2. His excellent match play is featured in Antonio Ortega’s book, “Backgammon With the Giants: Neil Kazaross”. He has cashed in three tournaments this year, including Las Vegas. Backgammon Openings: 2007 by Nack Ballard and Paul Weaver. The Backgammon Press. Hard cover. 126 pages (8.5″ x 11″). $39 + s&h. For ordering information, please go to www.nackbg.com/buy-the-new-book. This book was combed by several excellent proof-readers (and by the authors, dozens of times). However, if you find an error, please e-mail BGopenings@aol.com and it will be corrected in the next printing.